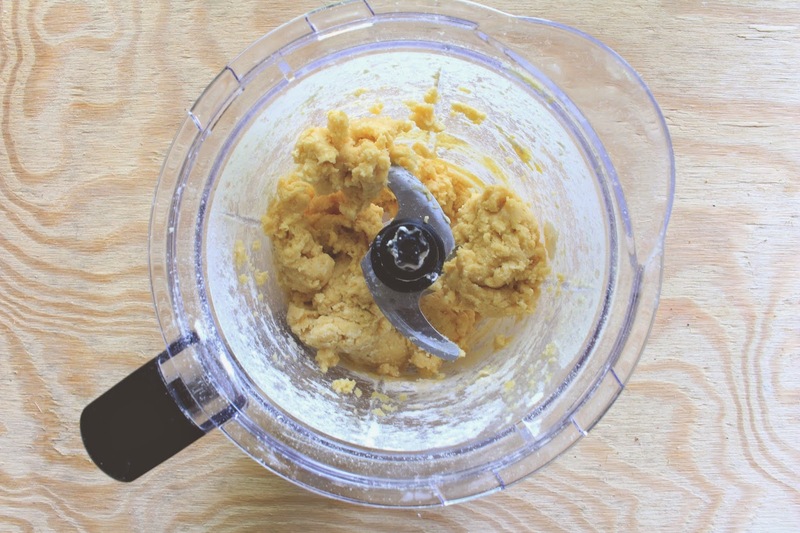 Add salt and flour to a food processor. Blend well. 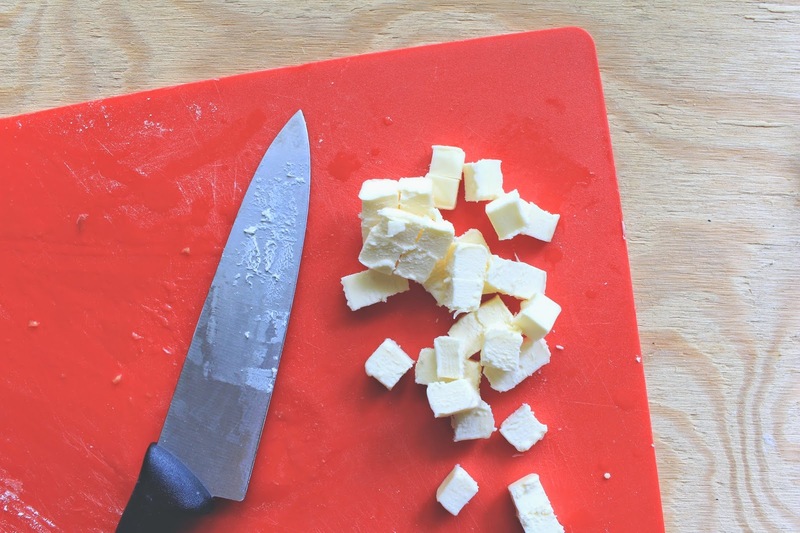 Add butter. Pulse 5 or 6 times until it looks like tiny little pebbles. Add eggs and water. Start with less water and add more as needed. Pulse a few times until dough forms into a ball. Separate dough into two equal balls. Wrap one up and store it in the fridge until you are ready to use on top. Sprinkle flour on foil on a flat surface. Roll out dough to be a little wider than your pie pan. Place pan upside down on rolled out dough and flip everything over, foil and all. 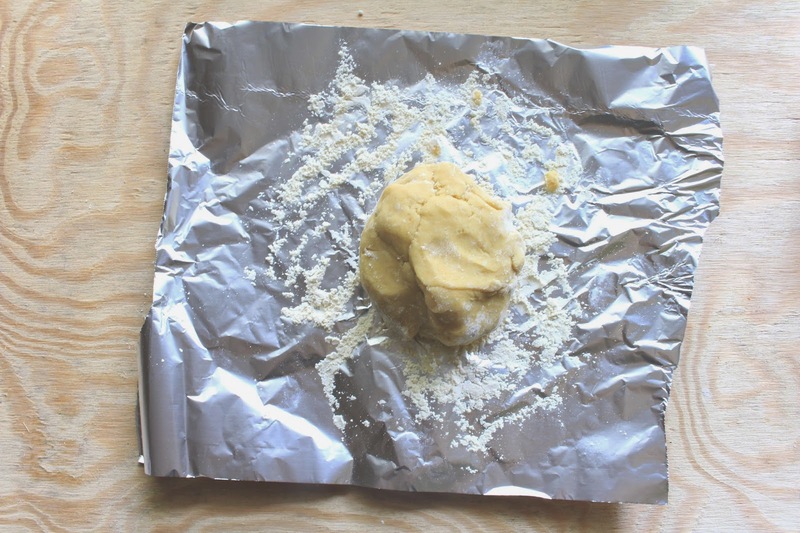 Remove foil and use your fingers to fit dough into the pan. Use a fork to poke holes in the crust. Heat lavender, water and 1/4 cup sugar in a small pot over medium heat. 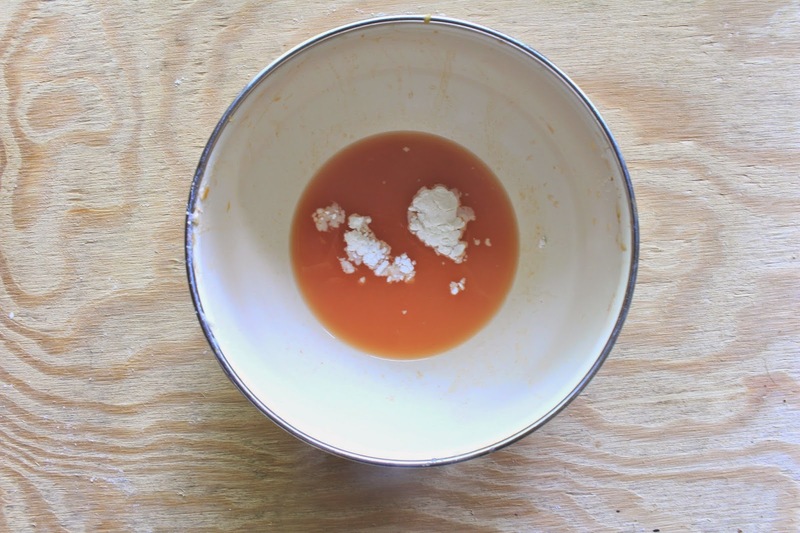 When sugar dissolves, turn off the heat and let mixture sit for about 30 minutes. The longer you wait, the more lavender flavor you will have. Strain out lavender. 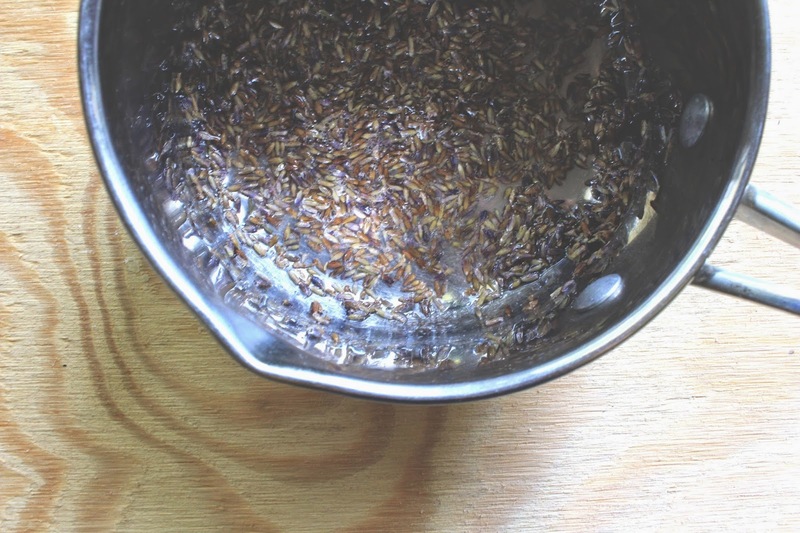 You now have a delicious lavender simple syrup great for lots of things. But for now we will just use it in this pie. 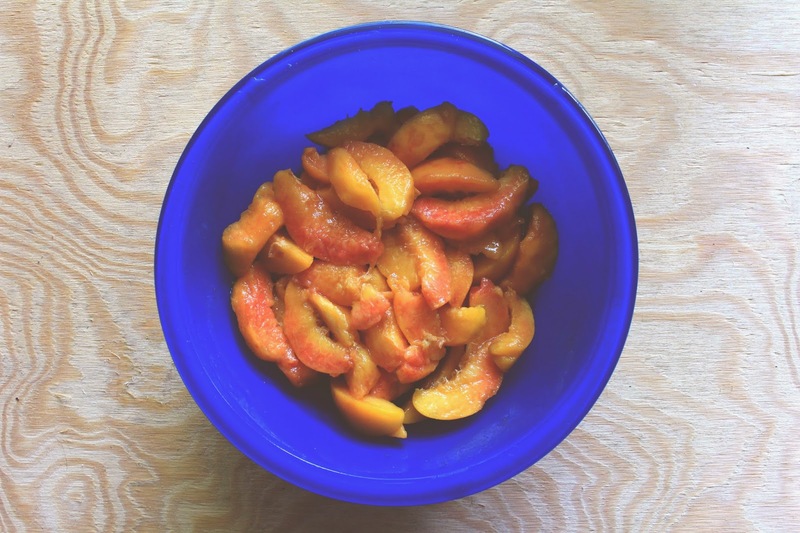 Add lavender syrup, lemon juice and remaining sugar to peach slices. Let sit for another 15 minutes. Strain out extra juice from peaches and save 1/4 cup of the liquid. Whisk cornstarch and liquid together and pour back over the peaches. 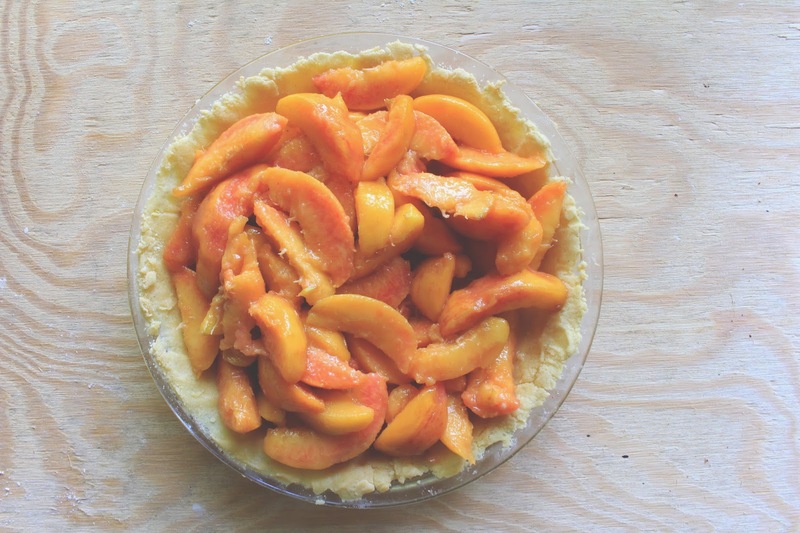 Add peach mixture to the pie filling. It will be a little liquid-y. That is necessary. 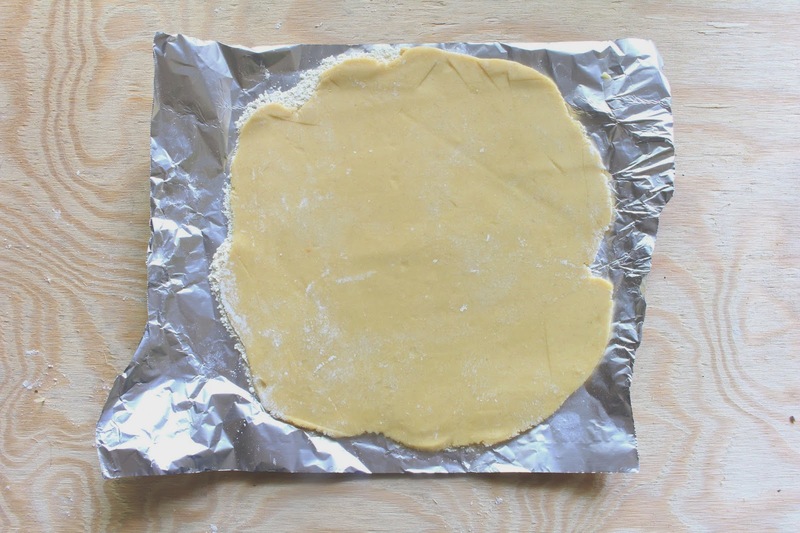 Roll out the reserved dough to be as wide as your pie crust and use a pizza cutter to cut it into strips. 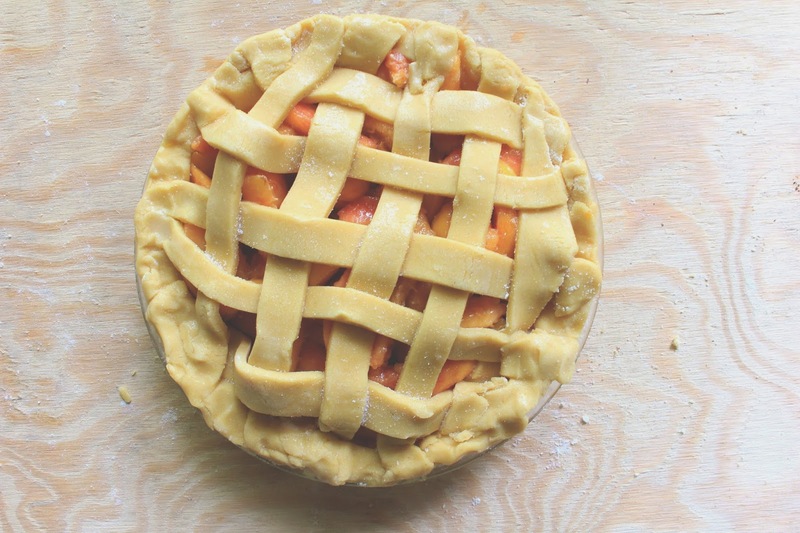 Lay strips out across the pie in one direction and then one weave one strip at a time in and out of the other strips. Repeat until pie is covered. Use fingers to pinch all the edges together. Fold the dough under itself if there is excess. 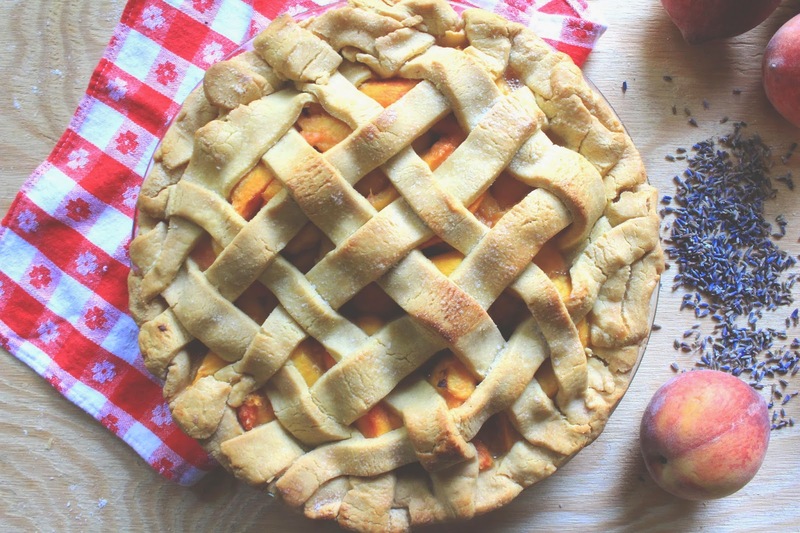 Bake the pie for 30 minutes at 400°. Place a baking sheet on a rack under the rack the pie is on to catch any drippings. Mine didn't drip until the last 10 minutes, but it did. Lower the oven temperature to 375° and finish baking for another 30 minutes. 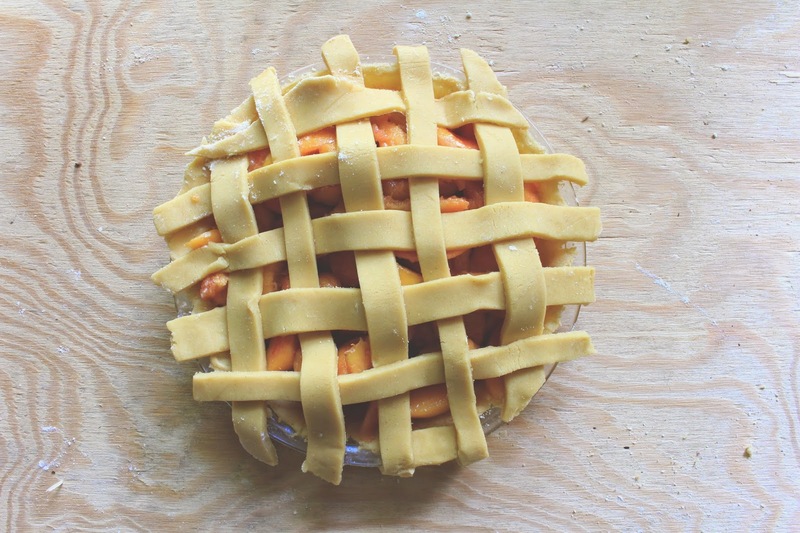 Let pie sit for at least 2 hours before cutting. Promise. Wait. It'll be worth it when you cut it and everything doesn't fall apart. 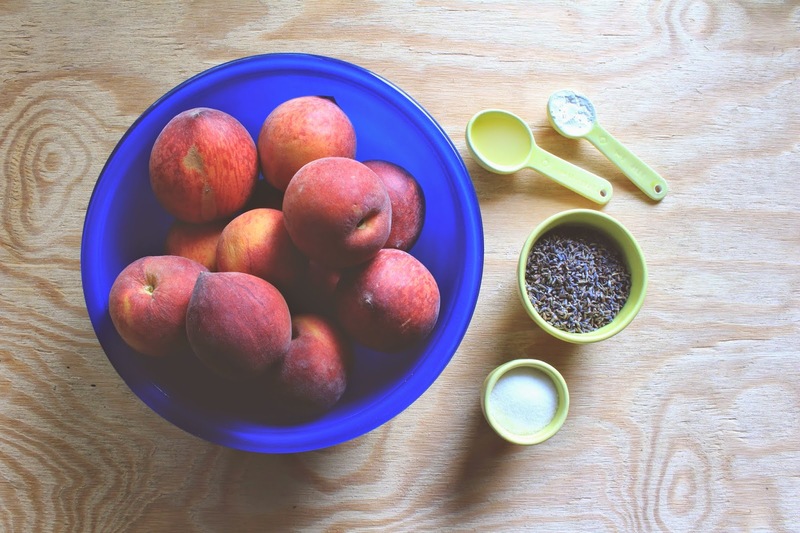 8 large peaches, peeled and cut into wedges. 1. 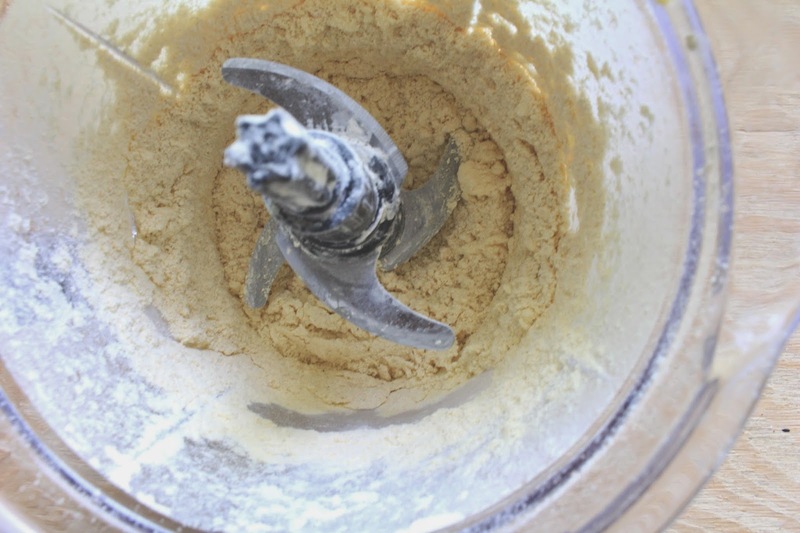 Add salt and flour to a food processor. Blend well. 2. 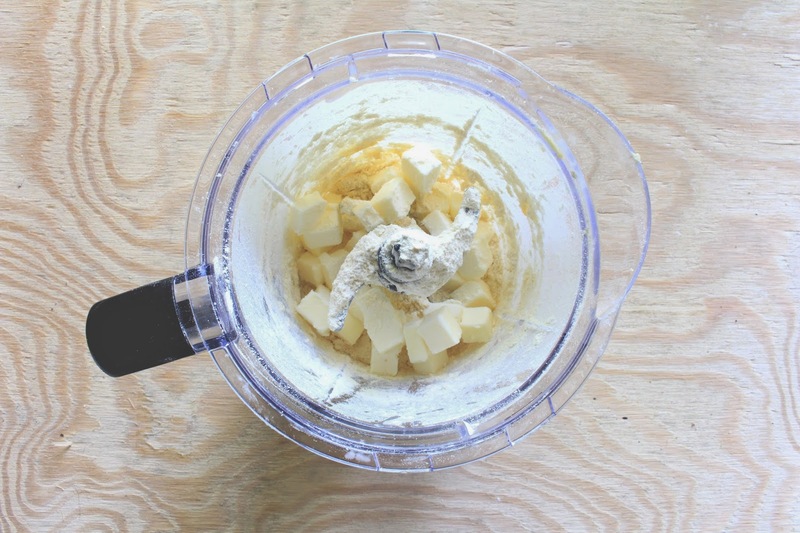 Cube the sticks of butter and add to the food processor. Pulse 5 or 6 times until it looks like tiny little pebbles. 3. Add eggs and water. Start with less water and add more as needed. Pulse a few times until dough forms into a ball. 4. Separate dough into two equal balls. Wrap one up and store it in the fridge until you are ready to use on top. 5. 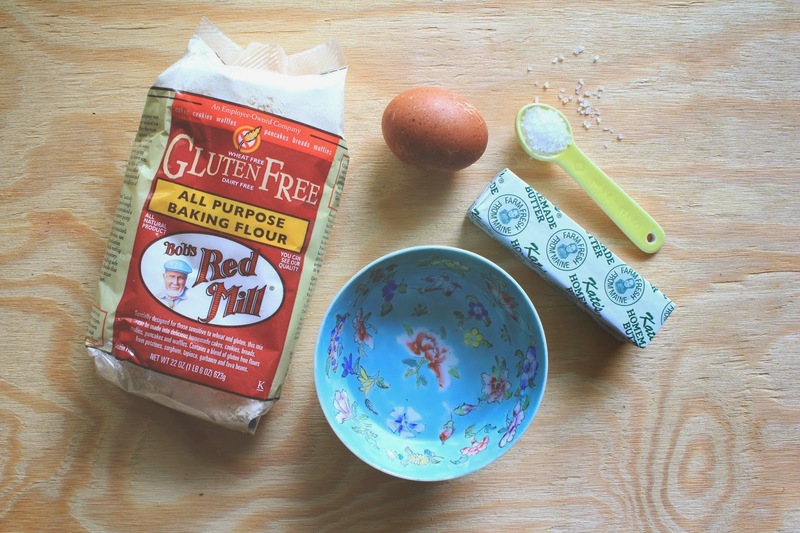 Sprinkle flour on foil on a flat surface. Roll out dough to be a little wider than your pie pan. Place pan upside down on rolled out dough and flip everything over, foil and all. 6. Remove foil and use your fingers to fit dough into the pan. Use a fork to poke holes in the crust. 1. Heat lavender, water and 1/4 cup sugar in a small pot over medium heat. 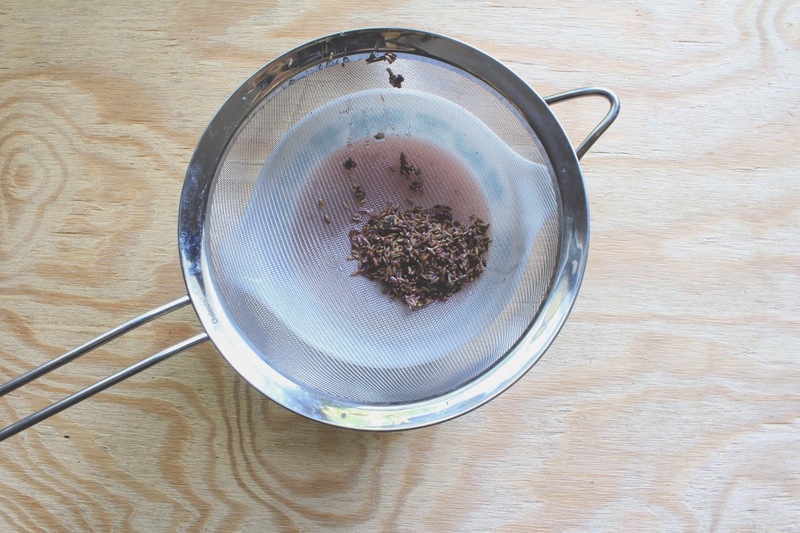 When sugar dissolves, turn off the heat and let mixture sit for about 30 minutes. The longer you wait, the more lavender flavor you will have. 3. 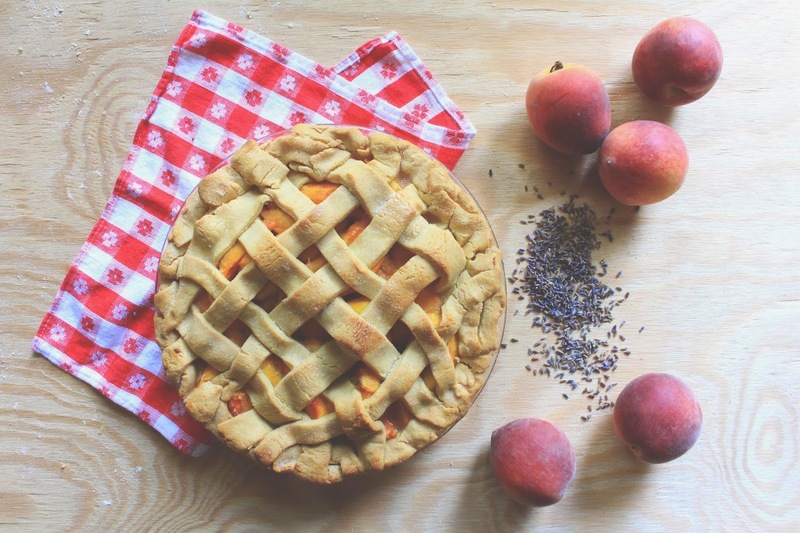 Add lavender syrup, lemon juice and remaining sugar to peach slices. Let sit for another 15 minutes. 4. Strain out extra juice from peaches and save 1/4 cup of the liquid. 5. Whisk cornstarch and liquid together and pour back over the peaches. 1. Add mixture to pie crust. 2. 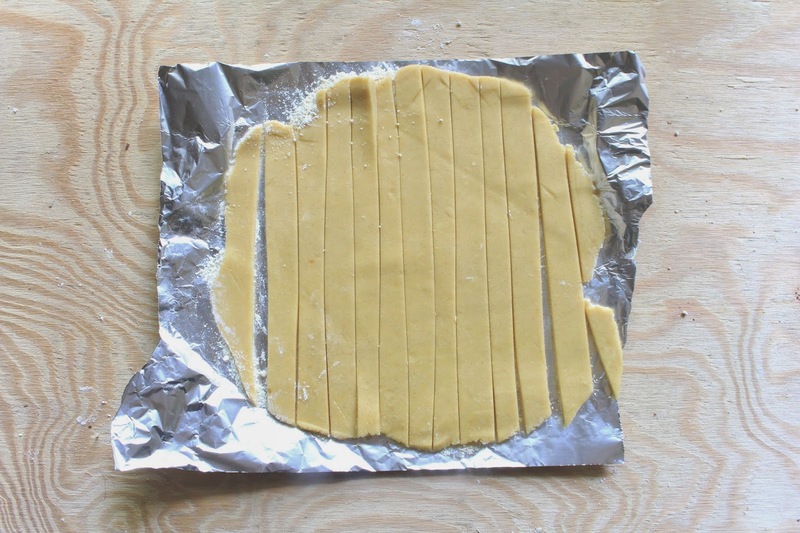 Roll out the reserved dough to be as wide as your pie crust and use a pizza cutter to cut it into strips. 3. 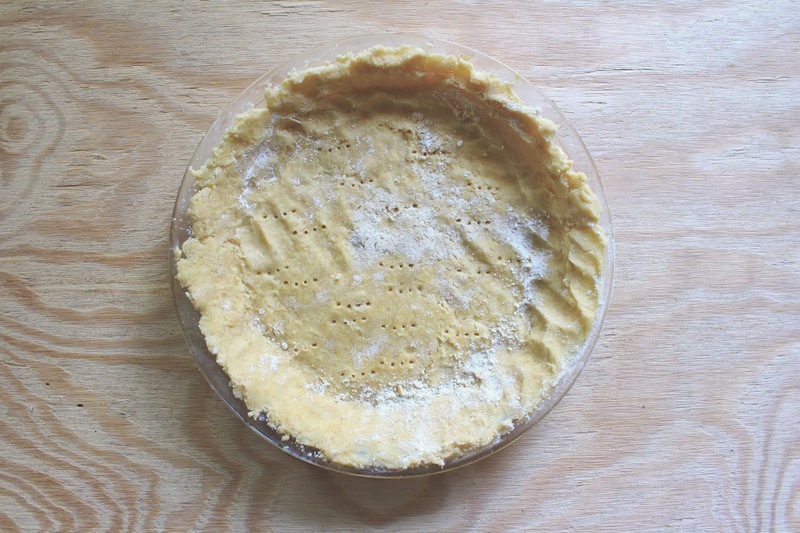 Lay strips out across the pie in one direction and then one weave one strip at a time in and out of the other strips. Repeat until pie is covered. 4. Use fingers to pinch all the edges together. Fold the dough under itself if there is excess. 5. Bake the pie for 30 minutes at 400°. Place a baking sheet on a rack under the rack the pie is on to catch any drippings. 6. Lower the oven temperature to 375° and finish baking for another 30 minutes. 7. Let the pie sit for at least 2 hours. This pie was pretty tasty! 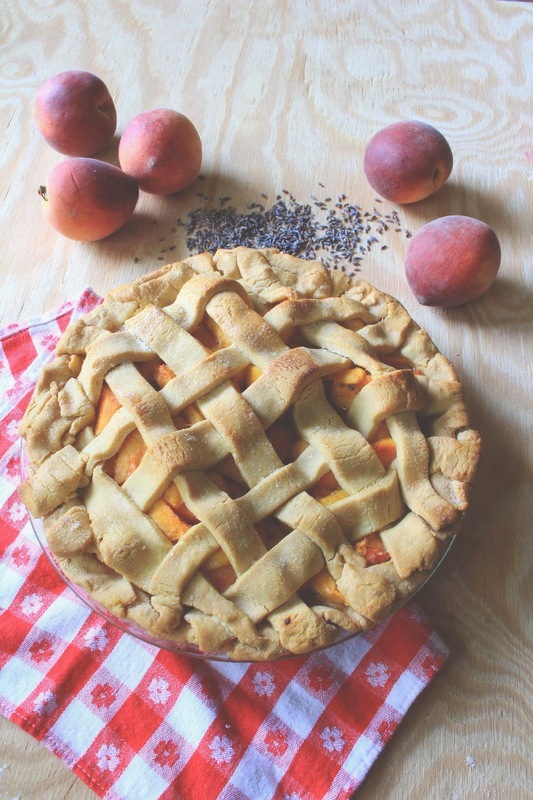 Honestly, I thought the pie crust was pretty impressive for being gluten-free. Unfortunately we didn't even get to finish all of it before the dogs got a hold of it. Still. not. funny. But we did get to share it with a friend so I don't feel like it was totally wasted! That looks absolutely beautiful and heavenly. Seems like it takes a bit of work, but it definitely looks like it's pretty darn worth it.